Generating twice the power of the P1, the award winning P2 drives the most challenging loudspeakers with ATC’s signature virtues of wide bandwidth and ultra-low distortion. Earn 3375 loyalty points when you order this item. ATC P2 is a 300W per channel dual-mono power amplifier which delivers full power simultaneously from both channels with minimal crosstalk while keeping the power supplies, signal and return paths discreet. 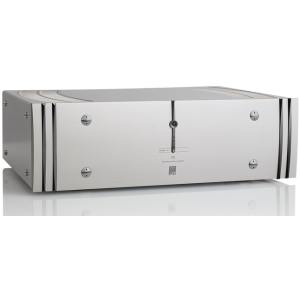 Hand built in the UK, the P2 power amplifier uses grounded source class A/B circuit topology, which is the same as used in ATC’s renowned active loudspeakers, designed to complement the operation and aesthetics of their hi-fi preamplifier range. This unique “grounded source” output stage ensures smooth power delivery and extremely low harmonic distortion. Developed in tandem with the P2 Pro studio amplifier, the ATC P2 achieves maximum signal separation with minimal crosstalk. Intermodulation between channels via the power supplies is reduced to an absolute minimum across a frequency range of 400kHz. The power delivery from one channel cannot affect the specified power available from the other. The ultra wide bandwidth results in low distortion and a high dynamic range for tonal accuracy and perfectly timed transients. The no-compromise, high-performance power supply and large heatsinks guarantee outstanding stability and long term reliability. Neutral fidelity ensures excellent product compatibility. Within a new low-vibration chassis design featuring a precision machined 12.7mm brushed aluminium front panel, the P2’s layout includes a massive, custom-made 400 VA low-noise transformer for each channel and an output stage involving 3 pairs of MOSFET devices per channel to achieve peak current output of over 15 amps. The gain of the P2 matches that of the lower power P1 (150W/ch) so that they can be used together in bi-amp or tri-amp systems, connected via the amplifier ‘Link’ phono inputs/outputs. The ATC P2 offers balanced XLR and unbalanced phono inputs, ‘link’ phono outputs, proprietary 4mm speaker terminals, and IR remote control.